4 years ago in Puppycide Leon Rosby Hawthorne Police Department Kathy Brown Vicente Vaquerano trial Hawthorne California ~ read. Puppycide victim Leon Rosby walked out of the Superior Court of Los Angeles County a free man yesterday following a trial that exposed shockingly unethical & possibly illegal behavior on the part of Hawthorne Police Department and the witnesses they used to bring Rosby to trial. 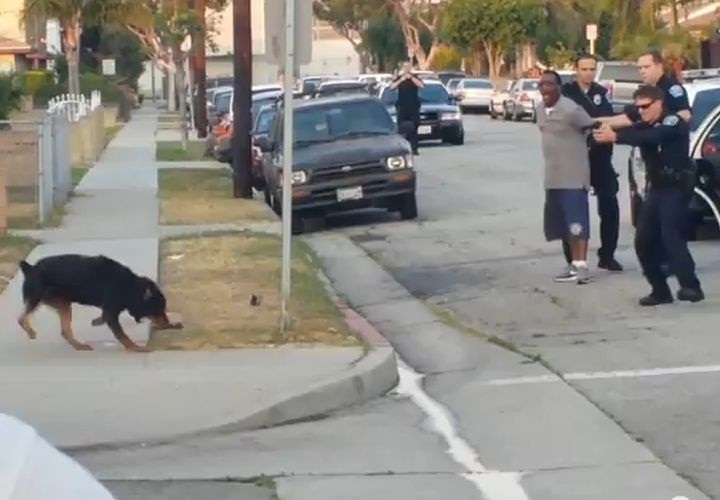 Prosecutors had initially charged Rosby with an array of six felony counts, accusing the former dog owner of threatening two people who had seen police shoot Rosby's Rottweiler Max to death in the street. At the time of the killing, Hawthorne Police arrested Rosby with misdemeanor charges of resisting arrest and nothing else. During the trial, testimony from the two witnesses that Hawthorne PD had produced fell apart. Kathy Brown took the stand to immediately tell jurors that she lied during her deposition when she claimed that Leon Rosby had threatened her. The other witness, Vicente Vaquerano, stuck to his story - but it became known that Vaquerano was paid an as-yet undisclosed sum for his statements through the California Victim Compensation Program (CalVCP). Such a payment would not normally be unusual, even considering that even Hawthorne PD did not allege that Rosby had explicitly threatened either witness with violence, as the payment was supposed to function as a form of "witness protection", enabling Vaquerano to move. The payment becomes more suspicious when the details are considered. Hawthorne Police apparently assisted Vaquerano with his application for the payment, but provided no such assistance to the other witness Kathy Brown - who had yet to recant her accusations of having been threatened by Rosby. Why protect Vaquerano and not Brown? Prosecutors also failed to provide defense lawyers with vital evidence in the form of videotapes of conversations between Vaquerano and Hawthorne PD. If some quid pro quo deal was established for testimony, the tapes of Vaquerano's interviews could expose such an arrangement. The failure to provide the tapes lead to the mid-trial dismissal of felony counts against Rosby. Jurors acquitted Leon Rosby of the remaining felony count of witness intimidation. Jurors voted to acquit Rosby 8-4 on the original charge of misdemeanor non-violent resisting arrest. The majority, 66% majority isn't enough for an acquittal under California law, and the 4 jurors voting for conviction refused to budge on their decision. A mistrial resulted. Rosby is not completely out of the woods yet - he will have to return to court on April 7th, at which time prosecutors will announce whether they will pursue a second trial on just the misdemeanor resisting arrest charge. While the state could pursue such a course, it would be a stunningly vindictive waste of resources to pursue a man in the face of mounting evidence that police manufactured felony charges against an innocent man with two pending lawsuits for excessive force & brutality against that same police department. "I asked [the Hawthorne PD detective inteviewing me] why they were messing with me so much. He told me the dog being killed was a misdemeanor. In order for [Leon Rosby] to go to trial, they had to have a felony." The Rosby case appears to represent some of the worst abuses among modern policing: the arrest and indictment of victims of police brutality, witness tampering and the manufacture of criminal charges to satisfy political goals. Puppycide, while itself a growing crisis, is a symptom of a deeper set of problems with law enforcement. It is the hope of the Pupppycide Database Project and our volunteers that increased transparency can provide part of the solution to these problems.